Launching on November 18th, Campbell Canada invites you to join a complimentary food experience by visiting The Cabin by Campbell's at The Toronto Distillery Christmas Market and La Cantine Par Campbell’s at 3547 St-Laurent Blvd, Montreal, Quebec. These pop-up restaurants will each serve up four delicious recipes designed by Chef Antonio Park, who will add his unique flare to create a variety of savoury interpretations using Campbell’s® Great for Cooking Condensed Soup, Ready to serve Soups , Ready to Use Broths and Soup Kits as a base. This holiday season gather your friends and family and visit The Cabin by Campbell’s at the Toronto Distillery Christmas Market! 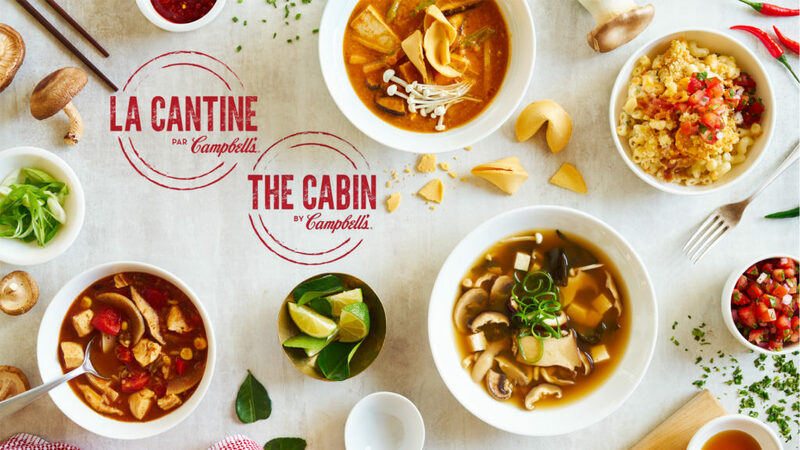 Campbell’s is taking over a restaurant space in Montreal's Plateau Mont-Royal Area to bring ‘Le Monde Est Soupe’ to life in Quebec at Le Cantine par Campbell’s. As part of the Le Monde Est Soupe experience, Campbell Canada is pleased to give back to the Montreal community. Guests are invited to contribute by sharing a social post about their experience at La Cantine Par Campbell’s and tagging with the hashtags #LeMondeEstSoupe and #Donation. For each post shared, Campbell Canada will donate one can of soup to Moisson Montreal, one of Quebec’s largest food banks, with the goal of donating up to 30,000 cans of soup. Each week, one of the artists will be on-site creating their own artistic interpretation of the iconic Campbell’s red and white soup can for guests to preview, while tasting the delicious recipes.